British Major General William Howe had pulled his soldiers out of New Jersey in the spring of 1777, having failed to lure George Washington into a open-field encounter. The reassignment of the British troops to Staten Island was only temporary, however. These forces were to serve as one prong in a larger three-pronged attack — the major component of the British war plan for the year. 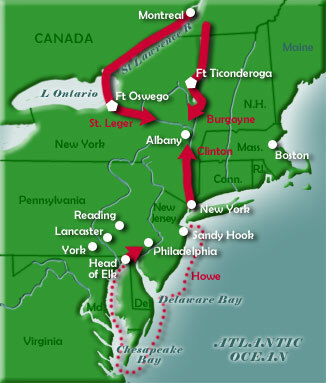 Howe’s army was to move northward from Manhattan and converge on Albany with the armies of St. Leger on the Mohawk and Burgoyne from Lake Champlain, effectively splitting New England from the other colonies. Prior to participating in that joint-venture, however, Howe did some tinkering with the war plan. He chose to interpret his orders from London as authorizing him to strike first against the American capital city, Philadelphia. He believed that the large Loyalist population in the area needed only a little encouragement to rally to the cause and that a strike against the seat of the American government would do the trick. Philadelphia, it should be noted, held little strategic importance and several negative features that should have given pause. The city was surrounded by a countryside that was largely hostile to the British effort and would only grudgingly offer assistance to an occupying army. The lifeline for supplies and reinforcements was the Delaware River, whose passage could be difficult and dangerous. In truth, Howe was largely motivated by a desire to erase the stain of the earlier losses to Washington at Trenton and Princeton, and believed that taking Philadelphia would accomplish that end. After completing his conquest in Pennsylvania, Howe planned to return to the Northern Offensive. These plans were a well-kept secret. Washington and his lieutenants were confused by the departure of British forces by ship from Sandy Hook on July 23. The fleet carried more than 15,000 soldiers and headed into the Atlantic before turning south. They were not spotted again by American agents for several days, when it appeared that they would enter Delaware Bay. Instead, Howe continued south. His soldiers were packed tightly on the ships and suffered terribly from seasickness and the blazing heat. They entered Chesapeake Bay, sailed to its northern extremity and sent the troops ashore at the head of the Elk River on August 25. Battle of Brandywine Creek (September 11, 1777). Howe's advance toward Philadelphia was first contested by Washington's forces along Brandywine Creek. The Americans were forced to retreat after the right flank under John Sullivan broke. Battle of the Clouds (September 16, 1777). Washington's recently defeated army was prepared to make a stand against the pursuing British army, but a sudden rainstorm ended hostilities. Washington retreated to Reading. Paoli Massacre (September 21, 1777). A surprise attack on Anthony Wayne's forces removed the last important barrier to the British occupation of Philadelphia. Congress fled from Philadelphia on September 19, settling first in Lancaster and at the end of the month at York. Howe entered Philadelphia on September 26, but joined the bulk of his troops stationed a few miles northwest of the city near Germantown. Battle of Germantown (October 4, 1777). Washington's surprise attack on the British camp outside Philadelphia initially went well, but fog and confusion helped to turn the tide of battle, forcing another American retreat. Loss of Forts Mercer and Mifflin (October-November, 1777). The unsuccessful defense of two strategically important American forts on the Delaware River ensured the British continued occupation of Philadelphia, but provided sufficient time for the Continental Army to head for its winter quarters. Washington had failed in his effort to prevent the British from taking the American capital city, but he had succeeded in the more important task to keep his army intact. While Howe enjoyed the comforts of Philadelphia, Washington led his forces into winter quarters at Valley Forge in mid-December.